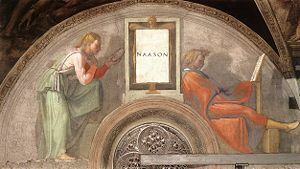 Nahshon (Hebrew: נחשון, Nakhshōn; Greek: Ναασσών, Naassōn; "Name means::enchanter") (ca. Born::2453 AM–fl. Flourit::1 Zif 2514 AM–Died::2553 AM), Nachshon, or Naasson, was the tribal chief and military commander of the tribe of Judah during the Exodus of Israel and the subsequent forty-year wilderness journey. He did not survive the journey, and his service was probably unremarkable. Nevertheless he was part of a distinguished line of descent that included David, all of the kings of the Kingdom of Judah, and ancestor of::Jesus Christ. Nahshon had a sister, Elisheba, who married Aaron and bore his four sons. (Exodus 6:23 ) All of those sons were adults and of the minimum age for Levitical service. Therefore Elisheba was probably born in 2454 AM, and Nahshon was born a year earlier. In the second general census, his tribe had 76,500 men and was still the largest. (Numbers 26:22 ) By then Nahshon was dead, and the Bible does not name his specific successor. ↑ Blank W, "Nahshon," Daily Bible Study, April 23, 2006. Accessed January 17, 2009. 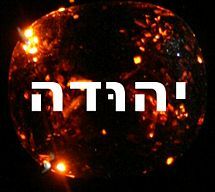 ↑ 2.0 2.1 Hirsch EG, Seligsohn M, and Bacher W, "Nahshon," The Jewish Encyclopedia, 1906. Accessed January 17, 2009. This page was last modified on 12 December 2009, at 20:41.